While I was interviewing Ela and Piotr about their Red Couch Tour project in the Polish Consulate in Toronto, it turned out that there was a meeting going on in another room. Consul General Grzegorz Morawski had very special guests – minister of communities responsible for housing of Guyana, the hon. Valerie Adams-Patterson with her official delegation, who came to get their Polish visas on the way to Poland. The delegation from Guyana was accompanied by Tom Krupa, a Polish Canadian and his business partner Esmond Gamo Klass, a Canadian of Guyanese extraction, whose company Greenheart Tree Energy organized the delegation’s trip. What a treat! We sat on the red couch to have an impromptu interview about this interesting Guyana-Poland-Canada story. We are hoping that minister Patterson’s visit to Poland turns out to be just a beginning of a long term mutually beneficial collaboration and that Polish houses will become part in Guyana’s new phase of development. 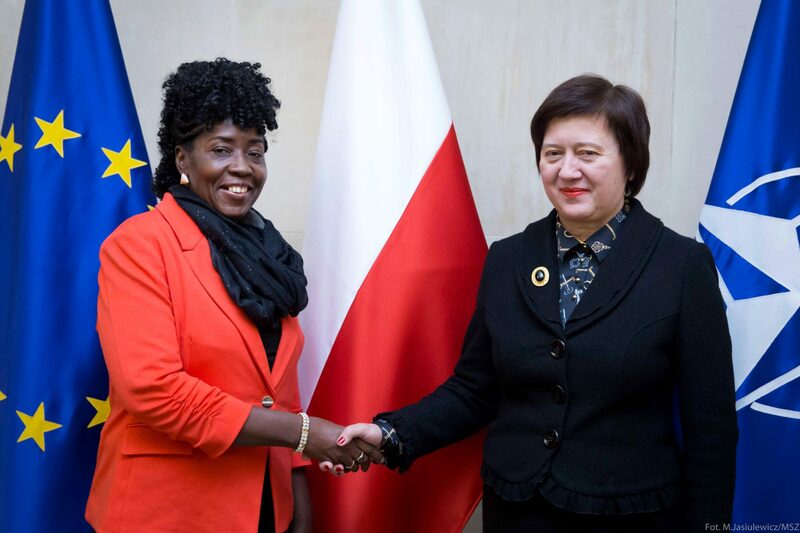 Perspectives of the Polish-Guyanese bilateral co-operation in the economic field were the subject of the talks of Joanna Wronecka with the minister of construction and co-operative urbanization of the Republic of Guyana, Valerie Adams-Patterson. Representatives of Polish and Guyanese business participated in those talks as well. During the meeting the deputy minister of foreign affairs of Poland Joanna Wronecka assured the delegation of the Republic of Guyana of increasing interest of Poland and Polish entrepreneurs in developing relations between the states of South America and Caribbean. – We have a chance to build good relations – stated vice-minister Wronecka. She also stated that it had been the first meeting between the representatives of the governments of both states in Poland for 80 years. She also emphasized importance of political relations, expressing hope for support of Guyana for the Polish candidature in the coming election for non-permanent members of the Security Council of the United Nations for years 2018-2019. Poland has been maintaining diplomatic relations with Guyana since 1972. At present, economic contacts between the states are rather minor, and trading does not reflect the potential of both countries. In 2016, according to preliminary data of Ministry of Development, the Polish export to Guyana reached the value of 2,57 mil. dollars, and the import – 1,92 mil. Opening of the Polish consulate in Georgetown headed by a honorary consul in 2016 is an element furthering a development of mutual contacts.